Launch of the first 100% Esports-Studies program in Canada! Electronic sport to counter isolationism, cyberaddiction and school dropout! 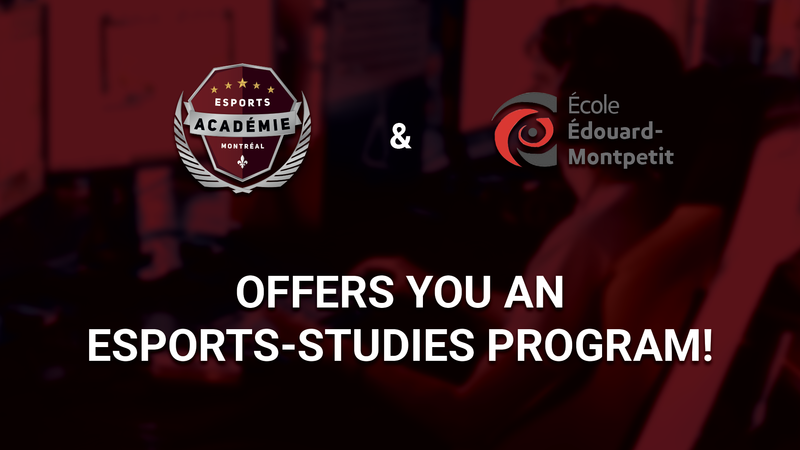 On September 14th, 2018, the Montreal Esports Academy (MEA) announces with an immense enthusiasm the launch of the very first 100% Esports-Studies Program in Canada. Our program operates under a formula equivalent to the various traditional Sports-études programs already offered in Quebec. This program, launched in collaboration with the Édouard-Montpetit High School of la Commissions scolaire de Montréal, is a major step forward for the growth of esports in Quebec and Canada. Such a program has the same benefits for participants as traditional sports programs. Improvement of physical and psychological health, socialization, reinforcement of the sense of belonging (team spirit), increase of self-motivation and reduction of school dropping, to name only these. Coaching and education are great ways to prevent cyberaddiction and cyberbullying. Our program promotes a healthy and structured video game practice. The program will be officially presented at the Édouard-Montpetit High School Open House (French only), on Sunday, September 30, 2018. We invite you to attend in large numbers! At the event, we will open the first registrations for 2019 which will allow us to probe the interest and adjust the number of groups accordingly. Our program will begin in September 2019. Our program is built on the acquisition of sustainable skills and applicable to other areas. Students will go to their regular school in the morning and travel to the MEA for e-learning in the afternoons. Our program is the first in Canada to offer instruction focused on the healthy practice of video games and to do so in a formula equivalent to the various traditional Sport-études programs. It is therefore through our unique approach that we can differentiate ourselves from e-sport concentration programs or other similar programs. In addition, our program is 100% e-sports and does not include programming, art or other. It is important to note that our program is not a Sport-études program. The fact that esports are not recognized as a sport in our province is blocking access to all government programs such as Sport-Studies.